Joel R. Bius is an assistant professor of national security studies at the U.S. Air Force Air Command and Staff College. He received his PhD in U.S. history from The Dale Center for the Study of War and Society at the University of Southern Mississippi. He is the author of Smoke Em If You Got Em: The Rise and Fall of the Military Cigarette Ration (Naval Institute Press, 2018). Those familiar with American pop culture in general, and American military culture specifically, are immediately familiar with the phrase "Smoke 'Em If You Got 'Em!" For generations it was a ubiquitous phrase associated with military service and soldiering that eventually spilled over into civilian life. Yet this phrase is rarely heard in contemporary military circles, if at all. The phrase has also vanished from the civilian sector. This observation begs the question: how did the cigarette-smoking "Smoke 'Em If you Got 'Em" wave come to dominate military culture during the majority of the twentieth century, and then abruptly disappear? Further, with the cigarette industry and Big Tobacco well-documented as one of the most powerful institutions in America during this period, what were the political-economic implications of this sudden shift? I wondered and I wrote a book about it. The American military-industrial complex and accompanying culture are most often associated with massive weapons procurement programs and advanced technologies. Images of supersonic bombers, strategic missiles, armor-plated tanks, nuclear submarines, and complex space systems clog our imagination. However, one aspect of the complex is not a weapon or even a machine but one of the world’s most highly engineered consumer products: the manufactured cigarette. My book describes the origins of the often comfortable yet increasingly controversial relationship among the military, the cigarette industry, and tobaccoland politicians during the twentieth century. After fostering the relationship between soldier and cigarette for a half century, the Department of Defense and fiscally minded legislators faced formidable political, cultural, economic, and internal challenges as they fought to unhinge a soldier–cigarette bond they had become entrenched. My research involved studying modern American political economy. Through this lens, one finds a paradoxical relationship among a host of characters possessing vested and varied interests in the cigarette enterprise. Whether bureaucrats, soldiers, lobbyists, government executives, legislators, litigators, or antismoking activists, all struggled over far-reaching policy issues involving the cigarette. 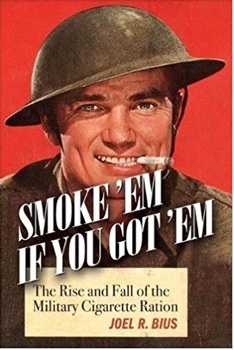 The topic is important because the soldier–cigarette relationship established by the Army in World War I and broken apart in 1986 underpinned one of the most prolific social, cultural, economic, and health-care related developments in the twentieth century: the rise and proliferation of the American manufactured cigarette smoker and the powerful cigarette enterprise supporting the sale of cigarettes. I focus in the book on the culture of smoking manufactured cigarettes in the U.S. Army, excluding other branches of service and modes of tobacco intake. Americans have a unique relationship with the Army, and in return the Army has had a broad and complex effect on American society, especially when considering cigarette smoking. The Army was the first service branch to issue manufactured cigarettes as part of field rations and the first to demand cessation from a cigarette culture it helped create. One will find Marines, airmen, and sailors in this saga; however, the soldier, for the most part, stands as the representative of American fighting men and women in this story. One will not find a year-by-year account but the story of the rise and entrenchment of the soldier–cigarette bond from 1918 to 1945, followed by the demise and dislodgement of that bond from 1973 to 1986. World War I and World War II play prominent roles explaining the entrenchment of the soldier–cigarette relationship, which reached its zenith in the immediate aftermath of World War II when the majority of American males were happy smokers. Important years such as 1952, when scientists definitively linked smoking with cancer, and 1964, when the U.S. surgeon general released the first general cigarette warning, are part of the story. However, the in-depth analysis resumes in 1973, when small cracks in this marriage of the Army and tobacco began to appear. These cracks grew to deep fissures over the next decade, leading to divorce in 1986 and the dislodgement of the long-standing military cigarette culture. From 1918 to 1986 the military established a powerful subculture of cigarette-smoking soldiers. The relationship was so rooted, after the 1964 surgeon general’s report warned Americans that cigarettes were hazardous to health, that a further twenty-two years were needed to advance military smoking cessation as official policy, and an additional sixteen years to sever government subsidies providing soldiers with low-cost cigarettes. The role of wars and the military in establishing and entrenching this American cigarette-smoking culture has often gone unrecognized. Using the manufactured cigarette as a vehicle to explore political economy and interactions between the military and American society, my purpose was to help the reader understand this important yet overlooked aspect of twentieth-century America.